First it was Nicole. Then it was Irene. New York dodged a major bullet when those two storms missed the mark. Its massive, essential subway system survived unscathed. But now New York City is really flooding and, unless a miracle happens in the next few hours, NOAA says this will be "widespread damaging storm, possibly of historic proportions." Perhaps the biggest ever in the region. This could be the storm that kills the New York subway system. According to the Wall Street Journal, MTA Chairman Joseph Lhota has declared that he thinks "Monday and Tuesday are going to be difficult days." Lhota believes that by "Wednesday [the MTA] should have service, but whether it's a full complement of service, it'd be very difficult for [him] to say now." Like everyone else, he admitted that "he doesn't know "when this event will end and when the power issues will be corrected." However, NOAA tells another story. They say that this is the possibly the largest storm to ever hit the area, with "widespread power outages and significant flooding." "The Hudson River has breached its banks 8.53 am" by Nigel Barker. What most people don't know is that we depend on just 700 fragile water pumps to keep the tunnels dry—some a century old. In fact, if someone powered down all these pumps tomorrow, the entire subway network would be inundated in just a few hours. To give you an idea of how complex and massive this system is, it pulls 13 million gallons of water out of the subway on any sunny day. No rain. Not even a single drop of water from the sky. If Sandy manages to kill the power or any of the fragile old pumps protecting the system, there may be some serious problems. On a rainy day, the pump system is absolute chaos, to the point where the MTA—NYC's Metropolitan Transportation Authority—lives in permanent panic, fearing events like Sandy, the hurricane system that is approaching the little town right now. "At some point, it would be too much to handle," said the head of the hydraulics team back in 2006, Peter Velasquez Jr., "you've got rain plus wind. It basically would shut down the system. You hope not. You pray that it doesn't. This means that NYC's hydraulic team—less than two hundred people—are now on full alert, ready to intervene and install additional portable water pumps in whatever stations are needed. This is not an easy task. When the water reaches a certain level it touches the third rail, which carries 625 volts. That makes the water extremely dangerous for these workers. Back in the 1990s, a water main broke open, completely flooding the station at 125th Street and St. Nicholas Avenue. They had to send scuba divers to fix it, and use a diesel-powered train car to take the water out. It took an entire week to drain the station, extracting 2,700 gallons per minute. That's more than 27 million gallons. But you don't need to fully inundate the tunnels to take the subway system out. The water flooding could take out entire lines if the pumps fail to keep the levels below their safety limits. 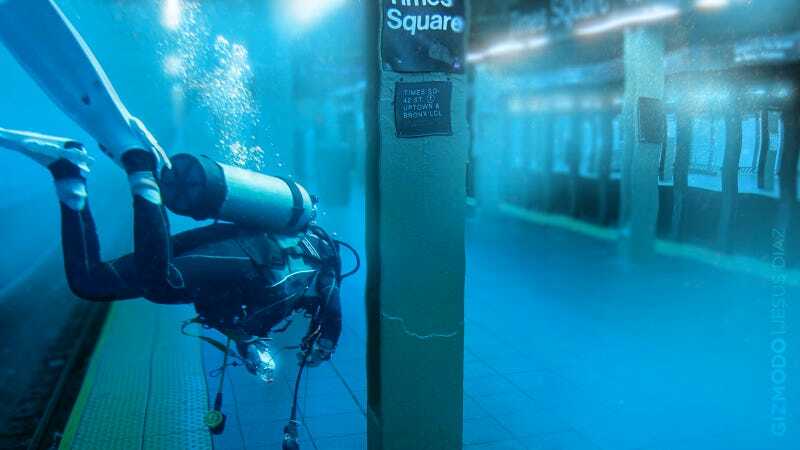 In 2004, the subway system stopped after Hurricane Frances spewed two inches of rain per hour over the city. In 2007, the system shut down again. At that time Governor Eliot Spitzer declared that "the cause of the cascading outages across the mass transportation system this morning was the inability of our drainage system to handle what was, we believe, three inches of rain within a one-hour period." Not much has changed since then. The MTA's drainage system still can only slurp 1.5 inches of rain per hour, which is much, much less than what Sandy is bringing. It sounds like Velasquez's scenario: You hope not. You pray that it doesn't.